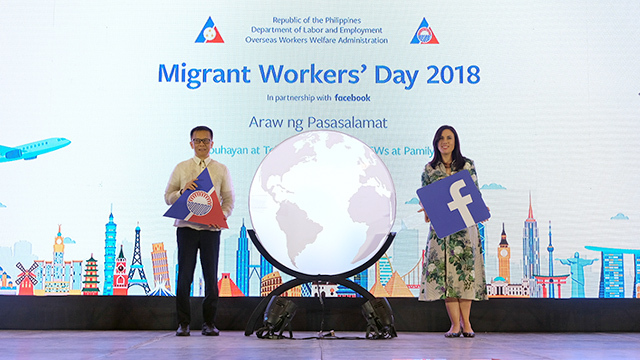 Facebook Philippines and the Overseas Workers Welfare Administration (OWWA) have teamed up to promote digital literacy and small business skills using social media among Overseas Filipino Workers (OFWs). This partnership was announced during the celebration of Migrant Workers Day in the Philippines. OWWA Administrator Hans Leo Cacdac said that OFWs work very hard for their families and communities. Through his experience with OFWs, some of whom have connected with him personally via Facebook, he realized that the social media platform became “a life line, a hope line, an assurance line,” for Pinoys everywhere. This is why OWWA wants to make sure that they can support them in the best possible way. “We are very excited to have Facebook on-board as we continue to uplift the quality of lives of our modern-day heroes—both through digital literacy and small business training,” he said. Through educational programs and workshops, OFWs will have access to resources that will help them gain knowledge about privacy and safety, critical thinking and empathy, and even spotting fake news, according to Clair Deevy, Facebook director of community affairs, Asia Pacific. This will be integrated in the exit program of OFWs as a one-hour digital literacy workshop. At the same time, informational videos will be played in OWWA offices and posted on their online platforms. For the safety and privacy part of the training, participants will be given tips such as using correct settings for sharing. Deevy said that the critical thinking and empathy part of the workshop is important given the information overload one can experience on Facebook. “How do you make sense of it especially when you are away from your family and friends? Even if you find out something to be true, what is the intent you have when you share it? Are you trying to bring joy and happiness? Or are you trying to harm?” Deevy said. This part of the module will teach departing Pinoys the difference between fact, opinion and false news. At the same time, a lesson about empathy is also shared, as well as how to practice empathy in a platform like Facebook, where bashing and cyberbullying can happen. Spotting false news is another skill Facebook and OWWA wants to teach OFWs. “Unfortunately there are bad actors out there who want to spread misinformation that are not true so we have some basic tips,” Deevy added. These tips include being your authentic self, choosing your friends wisely and being aware of scams. This workshop was pilot-tested on 70 departing OFWs in May and Deevy said that it had been a “really fun and interactive” session. This program will officially start by July and Facebook and OWWA hopes to reach over 40,000 OFWs this year. Another concern that OFWs have is how they can use their hard-earned money and savings for business. Since 2017, Facebook has been running programs like Boost Your Business and She Means Business, which are training modules for aspiring entrepreneurs. She Means Business has been partnering with groups like Connected Women to give Pinays opportunities to connect with women entrepreneurs around the world. OWWA has also been training OFWs and OFW family circles for skills like baking, sewing and being local tour guides for their areas—skills that will give way to different business opportunities. This is complemented by Facebook’s Boost Your Business module, which teaches OFWs and their family circles on Facebook marketing techniques. This includes how to set up a page, how to manage a page, how to understand page insights, how to manage Instagram, taking good photos and more. For this program, they will also be given a notebook with a checklist on what they can do to their page for the first 30 days, 60 days and 90 days. Currently, Facebook and OWWA are targeting around 1,500 OFWs and OFW family circles for this training. The locations and provinces being targeted for this program are being mapped out but Cacdac said that they will be definitely be announcing this to their members and circles. Non-members can also participate as they will be also posting details about these workshops in their Facebook page. “They could express interest before leaving, during or upon return via our hotlines, Facebook page and Twitter. We will open up the lines for anyone interested,” Cacdac said. He added that the training is very timely because he has met a lot of OFWs who were able to grow their business on Facebook. “The playing field in business has been leveled greatly by Facebook. They have the same capacity to draw likes and followings with big business. They can compete at par,” he said. Deevy said that as OFWs use Facebook to connect with their friends and loved ones back home, they also create a tremendous impact worldwide. “Together with OWWA, we want to help OFWs to have a positive and authentic experience online and gain business skills that would help their families and communities,” she said.